As mentioned on the Trezor blog post, their latest security patch fixes a flaw I disclosed to them in Jan 2019. This flaw meant an attacker with physical access to the wallet can find the recovery seed stored in FLASH, and leave no evidence of tampering. This work was heavily inspired by the wallet.fail disclosure – I’m directly dumping FLASH instead of forcing the flash erase then dumping from SRAM, so the results are the same but with a different path. It also has the same limitations – if you used a password protected recovery seed you can’t dump that. Practically, it has the advantage of not requiring you to modify/tamper with the enclosure at all either to do the fault injection or read data off . Wallet.fail uses the physical JTAG connection, whereas I’m using the USB connection. 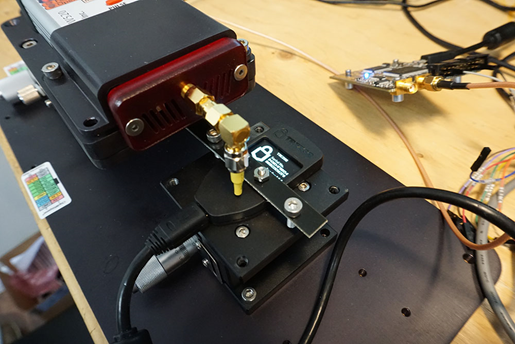 But by comparison the wallet.fail attack is more robust and easier to apply – my EMFI attack can be fiddly to setup, and there is some inherent timing jitter due to the USB stack processing. Without further effort to speed up my attack, it’s likely the process of opening the enclosure & applying the wallet.fail method would be a faster in practice. Please do not contact me if you have a “forgotten password” or something similar with your Trezor. I’m not willing to perform this work under any circumstances. USB requests that read from memory (such as a USB descriptor read) accept a maximum packet size that is MIN(requested_size, size_of_data_structure). The code as written defaults to accepting the requested size, and overwriting it with a smaller “valid” value. 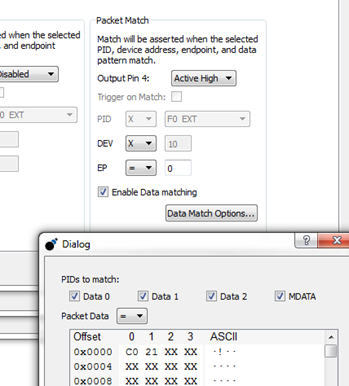 Using fault injection (here demo’d with EMFI), this check can be skipped. The device will accept up to 0xFFFF as a size argument, giving an attacker access to read large chunks of either SRAM or FLASH (depending where the descriptor is stored). Due to the FLASH memory layout, the sensitive metadata lies roughly AFTER the descriptors stored in bootloader flash space. 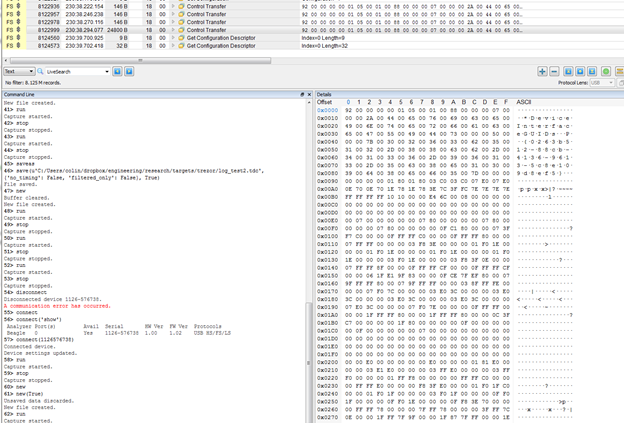 Thus an attacker can read out the metadata structure from memory (seed etc). Notably this does not require one to open the enclosure due to use of EMFI. Using voltage glitching would almost certainly work as well, but likely requires opening the enclosure making tampering more evident (possibly it would work via USB +5V input even which wouldn’t require opening the enclosure). 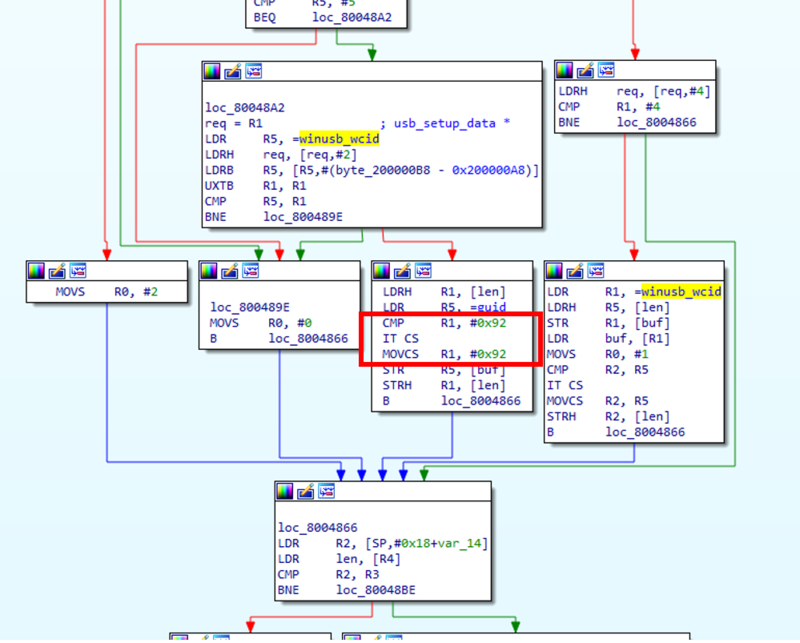 I’ve chosen to demo this with WinUSB descriptor requests, as they have a very simple structure. In addition the WinUSB has one descriptor in FLASH and one in SRAM, giving you the ability to chose which memory segment to dump. Other USB requests should work too, but I haven’t tested them. 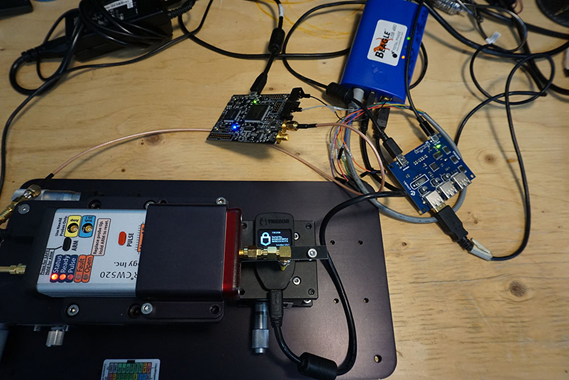 The entire setup is shown below, which has the ChipSHOUTER (bottom left), a ChipWhisperer-Lite (top left) for trigger delay, a Beagle 480 for USB sniffing/triggering (top center) and a switchable USB hub to power-cycle the Trezor when the EMFI triggers the various hard fault/stack smashing/memory corruption errors (top right). The forced bootloader entry mode simplifies the glitch, as we can freely power cycle the device and try many glitches. """WinUSB Request is most useful for glitch attack"""
To confirm the timing, I also compiled my own bootloader, and saw the sensitive operation was typically occurring in the 4.2 to 5.7uS after the Beagle480 trigger. There was some jitter due to the USB stack processing. A ChipWhisperer-Lite is used to then generate a 4.4uS offset (empirically a good “waiting” place), after which an EMFI pulse is triggered. Should the 4.4uS offset happen to line up with the length checking/limiting, we can get a successful glitch. Note you can “simulate” this glitch by simply commenting out the length checking operation in the WinUSB request. This allows you to confirm that should that operation be skipped, you can dump large chunks of memory including the metadata. This simulation could be useful in validating some of the proposed fixes as well (I would highly suggest doing such testing as part of regular building). Note due to the timing jitter the glitch is very unreliable (<0.1% success rate), however this typically translates to taking a few hours due to how quickly the search can be done. So it remains extremely practical since it seems reasonable for an attacker to have access to a wallet for a few hours. Send a USB request (get descriptor etc). After the USB request comes back, send our WinUSB/glitch target request at a very defined amount of time after we received the USB request. 1) The low-level USB functions should accept some absolute maximum size. 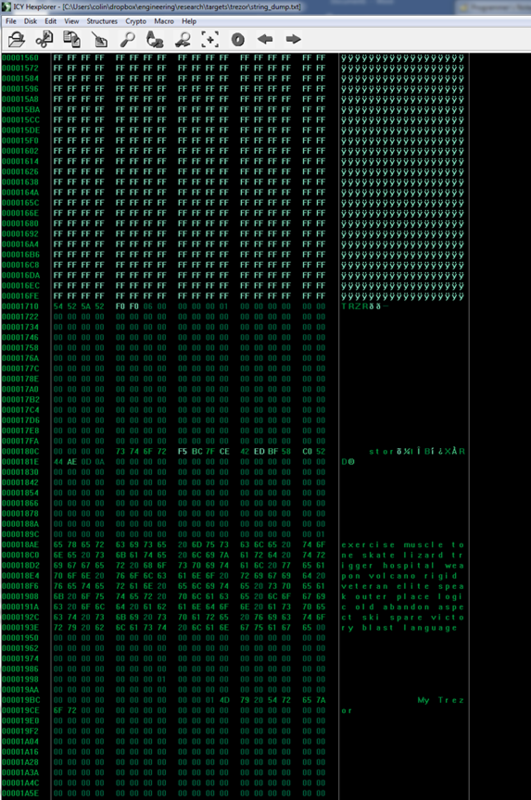 For example, if you only ever do 64-byte transfers, never allow a larger transfer to occur by masking upper bits to force them to zero. Do this in multiple spots to make glitching past this more difficult. 2) The metadata needs to be guarded by invalid memory segments. Doing a read from a valid segment to the metadata should hit an invalid segment, causing an exception. 3) Move descriptor /metadata arrangement (less useful than #2 in practice). EMFI is a simple way of abusing the USB stack in the Trezor. You’ll find a similar vulnerability in a number of USB stacks, meaning this type of attack should be something you validate against in your own devices. More details of this example will be available in the book Jasper & I are working on for (eventual?) release. 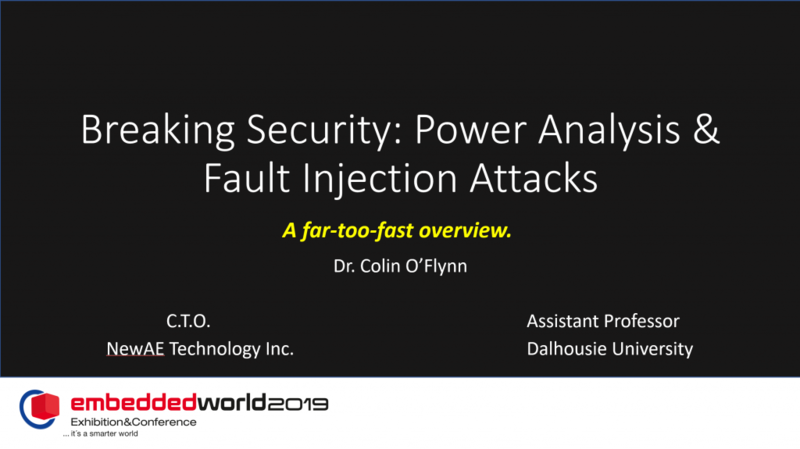 At Embedded World I gave a talk on embedded security. There was also an associated paper, and I’m now making those available. I’ve also duplicated the paper contents in this blog post for your ease of access. ABSTRACT: As interconnected devices proliferate, security of those devices becomes more important. Two critical attacks can bypass many standard security mechanisms. These attacks are broadly known as side-channel attacks & fault injection attacks. This paper will introduce side-channel power analysis and fault injection attacks and their relevance to embedded systems. Examples of attacks are given, along with a short discussion of countermeasures and effectiveness. The use of open-source tools is highlighted, allowing the reader the chance to better understand these attacks with hands-on examples. Side-channel attacks are the broad class given to attacks which rely on “additional information” that is accidentally leaked. A variety of such side-channels exist, such as the time an algorithm takes to execute can betray information about the code paths taken in the algorithm. Of great interest to embedded developers is side channel power analysis, first introduced by Kocher et al. in 1999 . This attack takes advantage of a small piece of information – the data being processed by a system affects the power consumption of that system. This allows us to break advanced cryptography systems such as recovering an AES-256 key in a matter of minutes. These attacks do not rely on substantial resources – they can be performed with commodity hardware and for less than $50. A second class of attack will be known as fault injection attacks. They allow us to modify the program flow of code, which can cause a variety of security flaws to be exploited. This paper will briefly introduce those two methods of attacks and discuss how engineers can understand them to develop effective countermeasures. The most basic form of power analysis attack is simple power analysis. In this method we will extract information about the algorithm flow. This could be used to directly extract key bits where changes in program flows reveal key information (such as with RSA), but can also be used to extract information such as timing that simplifies further attacks. Observe a simple password check which checks a byte of the password at a time. The execution time through this algorithm would reveal which password byte was incorrect, allowing an attacker the ability to quickly brute-force the algorithm. A password of ADBC would entail only the guess sequence “A/A..B..C..D/A..B../A..B…C” to find the correct password, as once the correct letter is found for one digit the guess algorithm can move onto the next digit. Such an attack could be performed from the communications protocol. But many systems will add a random delay before returning the results. With power analysis we could see the unique signatures in the power trace, as in Figure 1. Fig. 1. 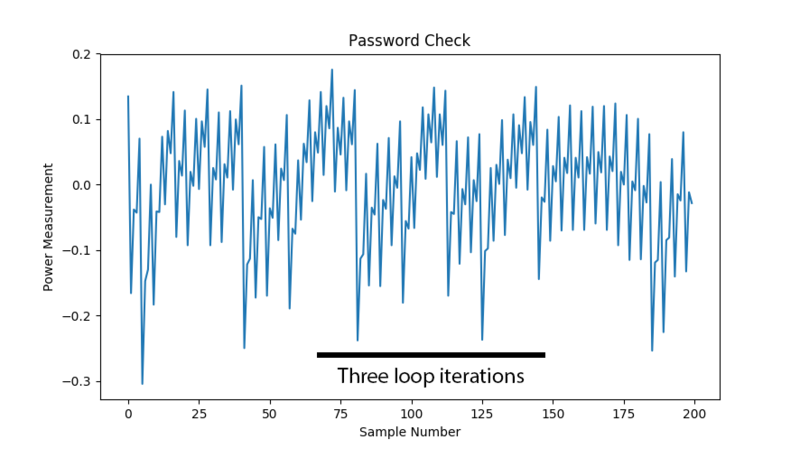 A simple password check shows how many iterations through the loop we took. 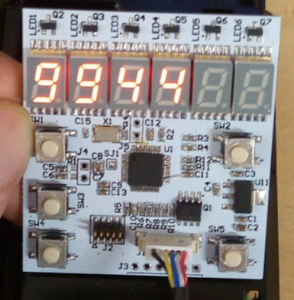 These power measurement examples are taken with the ChipWhisperer project. Here the power measurements are done by inserting a shunt resistor into the device power pin, and using the fact that a change in current will cause a change in voltage across the resistor. The decoupling capacitors are removed in this example to provide a clean signal. This is shown in Figure 2. All this is posted on the GitHub Repo, so hopefully you find it useful! If you’ve seen my presentations anytime over the past few years, you’ll know the introduction about “PhD Student at Dalhousie University finishing ‘soon'” has been the claim for the past several years. Finally ‘soon’ actually happened! You can see my complete thesis entitled “A Framework for Embedded Hardware Security Analysis” on the DalSpace website. It’s been a ton of fun doing the PhD, and I’ve had a lot of help over the years which I’ve very grateful for. For the foreseeable future I’ll be continuing to spin up NewAE Technology Inc., and keeping my ChipWhisperer project alive. This is a quick post to link to slides from my Black Hat USA 2016 work.